A Brazilian Supreme Court (STF) justice decided on Thursday to suspend a probe into a former aide to president Jair Bolsonaro’s son. The ruling provoked a backlash both from supporters and critics of the newly assumed far-right government. The STF duty judge Luiz Fux ordered Rio de Janeiro state prosecutors to suspend the investigations into “atypical” banking transactions of a former aide of state lawmaker and senator-elect Flavio Bolsonaro, Fabrício Queiroz, which include payments of thousands of reais to the now first lady, Michelle Bolsonaro. Sitting lawmakers and politicians in Brazil enjoy legal protections and can only be tried in the country’s top court, a right to which Flavio Bolsonaro, his father, and politician brothers have been outspokenly opposed before Fux’s ruling. When the scandal broke, the senator-elect denied the allegations involving him, claiming Queiroz was the one who should answer to the accusations, not him. 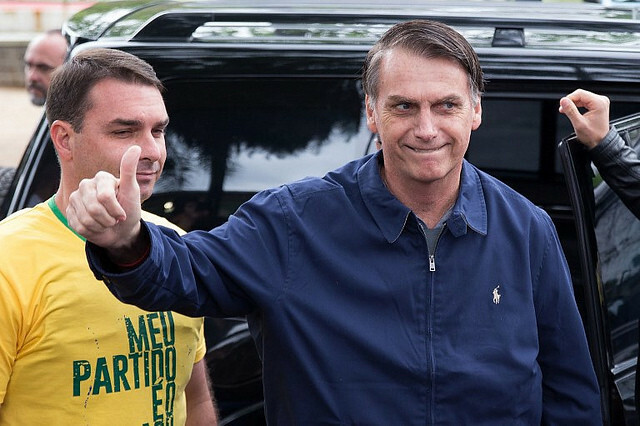 Fux granted an injunction requested by Flavio Bolsonaro’s lawyers, which came as a surprise to those who were following the case and other Supreme Court justices. Flavio Bolsonaro’s unexpected request to Brazil’s highest court was seen as a strategic mistake. Last year, the Supreme Court ruled that it would step in only in cases that happened while the member of Congress involved is serving their term and try only cases related to the office they hold. Fux’s decision will be in effect until the end of January. The Supreme Court is in recess and will resit in February, when another justice, Marco Aurelio Mello, will rule on the case and can actually further the probe into Queiroz’s bank accounts. In a previous statement released last month, Flavio Bolsonaro’s PR office wrote the congressman was “the main party interested in having the facts clarified.” Last night, however, the president’s son took to Instagram to share a statement arguing he decided to file the request with the Supreme Court because he found out he was being probed by the Rio de Janeiro state prosecution (MP-RJ) as well, and not just his former aide. The senator-elect also wrote that the MP-RJ breached the confidentiality of his bank and tax record and conducted “illegal” procedures to investigate him.